Fun fact of the day: bakers twine and butchers twine are not interchangeable. I learned this the hard way on a rainy Tuesday night last week. 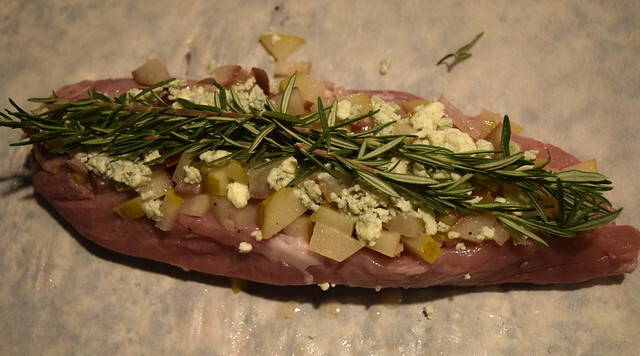 In full disclosure, I wanted to make this bourbon fig and gorgonzola stuffed pork tenderloin recipe, but after scouring my local grocery stores and farmers markets for figs, I decided to move on to this blue cheese, pear, and shallot stuffed pork tenderloin. I only had bakers twine, which I learned shouldn’t be used on raw meat. So, I had to get creative and decided to use the parchment paper I had on hand. After stuffing the pork tenderloin with all the fixins’, I wrapped it in parchment paper and then secured it with the bakers twine. Thankfully, it worked just fine! If you have access to butchers twine, I would suggest using that, but don’t worry if you don’t – there are workarounds! 1. Heat oven to 425 degrees. Dice pears into small 1/4 inch squares. Thinly slice the shallot. 2. Melt butter in a pan over medium heat. Add the shallots and 1/4 teaspoon Salt and 1/8 teaspoon black pepper. Sauté for 2 minutes, stirring frequently. Add the pear and the white wine. Let steadily simmer until the liquid has absorbed and the pears are translucent for about 12 minutes. 3. While the pears simmer, slice the pork tenderloin horizontally down the center. Slice almost all the way through the tenderloin, and then lay it flat. 4. 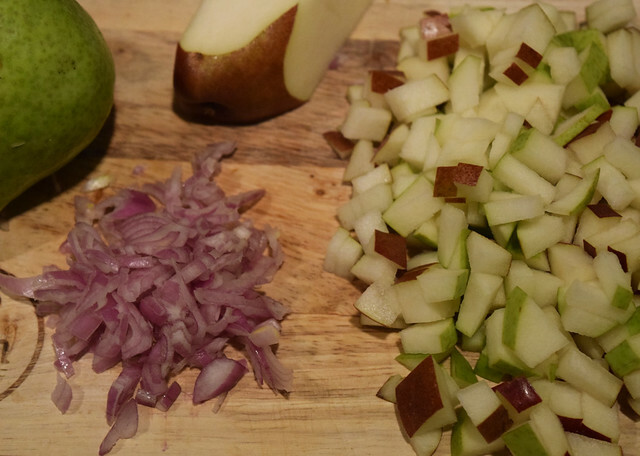 Once the pears and shallots are done simmering, generously pile the mixture into the center of the tenderloin. 5. Pile the crumbled blue cheese on top of the shallots and poached pears. Cut the butcher’s twine into 6 inch pieces. Then, press the shallots, pears, and blue cheese down and pull the tenderloin together, top with the rosemary, and tie with the butcher’s twine. The easiest technique is to slide the butcher’s twine underneath the pork and then pull the pork together and tie it closed. Cut the excess twine after tying it. Top the pork with the remaining salt and pepper. 6. Heat olive oil in the same Dutch oven or pan (no need to wash it) over medium high heat. Once the pan is hot, add the pork tenderloin and sear for 2-3 minutes until it has browned. Rotate the tenderloin in the pan 2-3 times letting all sides brown. 7. Place a lid on the pot, and put the tenderloin in the oven to bake. Let the tenderloin bake for 12 minutes, or until it reaches 145 degrees with a meat thermometer. 8. Remove the tenderloin from the pot and place it on a cutting board to rest. The tenderloin needs to rest for 5 minutes before slicing it. This keeps the juices in the meat making it tender. 9. Pour the chicken broth into the pot used to cook the tenderloin. Simmer over medium heat, scrapping up the browned bits with a wooden spoon. Let reduce and thicken for 5 minutes creating a sauce. 10. Slice the tenderloin, removing the butcher’s twine as you go. Serve with the sauce poured over the meat.